A news bulletin was posted this morning to announce that Sengoku Basara 4 Sumeragi will be one of Capcom's featured games at the Nico Nico Choukaigi 2015 event on the 25th and 26th April 2015. There will be live streams from the event including an interestingly-named Sengoku Basara 4 Sumeragi VS DMC4 SE channel. Further details will be revealed next week. It's still a month away, but could this be the first sign that the promotion for the game is beginning outside of dedicated Sengoku Basara events? April will also feature six fan club events spread across three consecutive Saturdays. 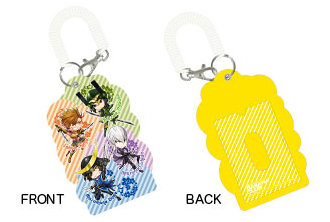 I posted the details back when they were first announced but the fan club website updated this week to confirm that exclusive merchandise will be available for attendees, too. 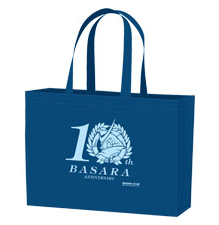 The stationery set and towels are already available from the official fan club shop online. For the rest, leftover stock will probably appear in the shop shortly after the event except where they've specifically indicated that an item is event-exclusive. Yukimura is the star of yet another Osaka-based historical exhibition next month as the Sengoku Warrior Chronicle Fair Chapter 1 "The Mystery of Sanada Yukimura" exhibition runs in Namba Marui between the 3rd and 26th of April 2015. Capcom are supporting the event with a Sengoku Basara 4 Sumeragi booth which will play the game's promotional video for the crowds and offer merchandise and photo spots. I wonder whether the series' cute Yukimura-kun mascot character will also make an appearance? He's shown up in Osaka a few times now. 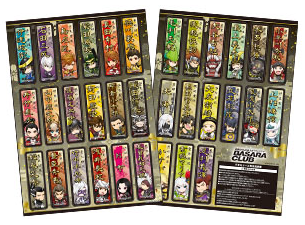 The previous tie-in last summer must have been a success since the folks at Sumzap have partnered up with Capcom once again for a second Sengoku Enbu -Kizna- x Sengoku Basara 4 collaboration event! It was titled Sengoku Basara 4 Kensen Ranbu and it ran from 9th March until 18th March 2015. Those who don't play the game can get an idea of what's involved in this event report from Inside Games. 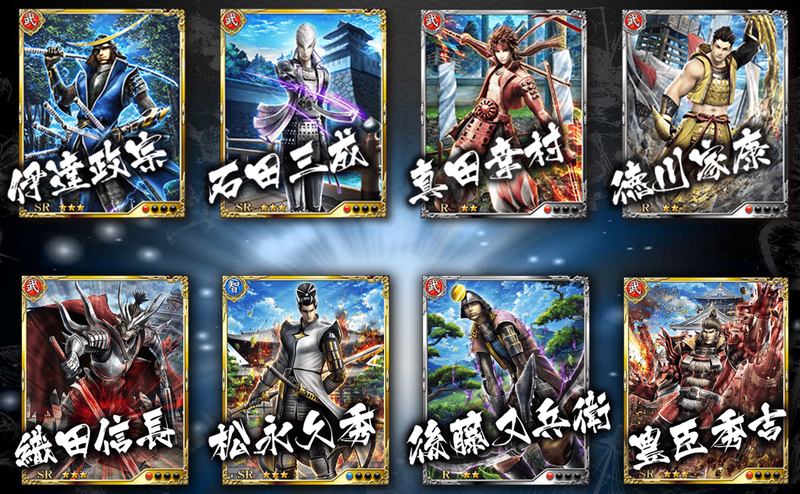 Samples of the previous in-game collaboration cards can be viewed here. The listings for the mysterious upcoming book Sengoku Basara Art Works were recently updated to give it a fascinating new title: Sengoku Basara Seishi ("The Official History of Sengoku Basara"). Still scheduled for release on 15th April 2015, the description has now completely changed to explain that it's a book which delves into the actual history behind the game. Topics it will cover include comparing the real historical figures with the in-game versions, events such as the Battle of Sekigahara and actual military tactics. An art book would have been nice but this sounds quite interesting too! Fans of T.M.Revolution can get an early start on the Sengoku Basara 4 Sumeragi content when his latest album, Ten ("Heaven") goes on sale on 13th May 2015. It will mark the anniversary of his debut nineteen years ago. The game's theme song, DOUBLE-DEAL, is planned for inclusion on the album as one of the brand new tracks, and two special CD+DVD editions of the album will each include different live footage from T.M.Revolution concerts last year. The CD is available for preorder at all good import stores and it's very likely that the song will be put up on iTunes internationally, since Nishikawa is well aware of his non-Japanese fans. While researching this post, I also discovered that there's a remix called Count ZERO (Re:boot) on last year's Phantom Pain EP. You can hear samples of it via iTunes or Amazon Japan. It's probably old news to big T.M.Revolution fans but I thought it was neat! Sumeragi is going to come out this summer, yes? So isn't it a little weird that there hasn't been more info so far like for example who else is playable. I'm surprised that there is suddenly a DMC4 special edition, that game came out a long time ago now. There are so many events going on next month that I cannot imagine the silence will last much longer. A July release would be nice to coincide with the tenth anniversary but I guess it could still be late summer if things won't be ready by then. Otherwise we're going to be bombarded by a lot of news soon. I don’t like how they release a never-ending stream of random merchandise instead of meaty content/info. Now if they indeed made a glorious anniversary art book then they could probably manage to squeeze some more money out of me. Hopefully the developers are quiet because they’re too busy producing an awesome game. Yeah, it's a strange change to the original description. I think it could be quite interesting though (though I'm hoping for an anniversary artbook too as there are hundreds of gorgeous illustrations that have never been gathered up into a collection at this point). Also *releases a slight whine* that the club site shop isn't accessible for those who can't join the club. I'm not Japanese so joining doesn't make a lot of sense as I can't really attend any of the events/meetings. 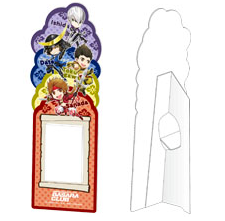 I'd snap up those Kenshin and Kasuga badges (probably Mogami too for the whimsy of owning an official Yoshiaki product lol) that'll be invariably left over like a shark. ...w a i t you get a birthday card with favored warlords on it? Thanks, everything looks so sharp in the new screenshots! It will be my first PS4 game so I'm looking forward to it.